Last year at the Sydney Writers Festival I met Hannah Richell, author of the international bestseller Secrets of the Tides. Since then, its been so inspiring to witness her progression from debut novelist to highly-acclaimed author of her second novel, The Shadow Year, in such a short space of time. 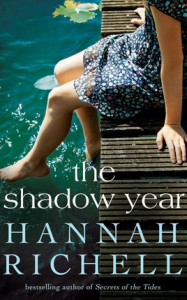 Anita Shreve calls The Shadow Year an engrossing and clever tale, a thrilling endorsement for any writer, and Thuy On writes about the book here for The Australian. I found its mystery especially powerful and foreboding (just like that within Secrets). It kept me guessing right to the very end, and I was reminded of books by Donna Tart and Jodi Picoult even though Hannah has such a distinct voice of her own. I simply loved the moody sense of place she created in the UKs Peak District, and the use of a plant called Honesty within the story (which she writes about here). I cant wait to see what she does next. The good people at Hannahs publishers, Hachette, have offered Crafty Minx readers 5 x giveaway copies. First in best dressed but please, do tell, what would you do with a year off from all responsibilities? Im curious to hear. And feel free to email me at kelly@thecraftyminx.com.au if youd rather keep your answer under wraps. Dont forget to pop in your mailing address.